Edin Jusuframic piece focuses on the balance between collective well-being and the human ego. What happens if the balance is upset and the ego takes over? Find out in this dance piece about the inner emotional conflict born from the constant trade-off between cooperating, being selfish or compromising, and how doing so can affect the artistic outcome. MeYouI is a dance performance just over 50 minutes long, with newly composed music by Mario Perez Amigo, who has previously produced music for Fredrik “Benke” Rydman’s work. The lighting is designed by Lumination AB, one of Sweden’s best light designers. Dancer and choreographer, born 1986. Edin has worked professionally with dance for twelve years, and has, among other things, choreographed and danced behind some of Sweden’s most outstanding artists in various contexts: Danny Saucedo, Ola Salo, Zara Larsson, Molly Sandén, Miss Li, Darin and many more. He has also performed as a dancer in a large number of dance productions and TV productions, including among other One Flew Over the Cuckoo’s Nest, The Rite of Spring, The Nutcracker, West Side Story, Melodifestivalen, Sommarkrysset, Sing-along at Skansen, Eurovision Song Contest. 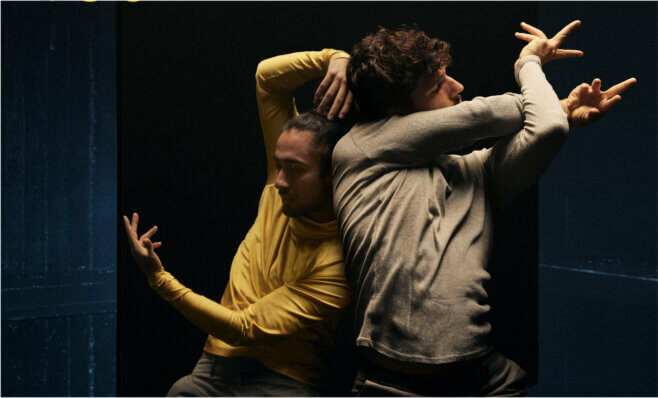 In 2008, Edin Jusuframic became one of the founders and members of the dance company Complete Dance Crew which has had great success both nationally and internationally with the works SIRI, Lost In Complete and Spezialisterna. For more about Edin Jusuframic’s work as a dancer and choreographer, please visit his official website edinj.se.